Rasmussen, Scott (2012). “The People’s Money”. Threshold Editions. New York. Since 1835 when Alexis De Tocqueville published Democracy in America, United States’ political system has been worldwide perceived as a key part that contributes to its economic success. Democratic political Institutions such as the so-called “check-and-balance” and liberal economic ideas such as “free market” are said to be the major strengths of America’s Society. Between those two sets of political and economic values, is the idea that having democratically institutionalized procedures for taking decisions represents the core value of the American System. However, since the beginning of the “Great Recession” such idea has been under fire from all fronts of the ideological spectrum. 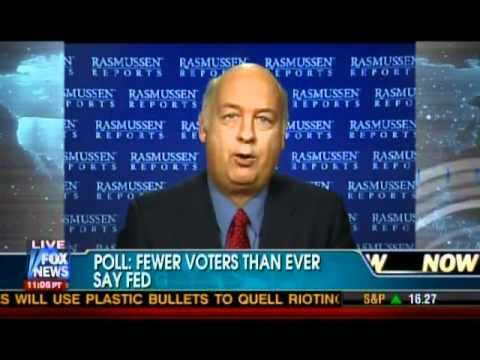 One of the critiques comes from the pollster Scott Rasmussen. In his book “The People’s money” Rasmussen uses his polling experience to bolster the argument that the “Political Class” has failed to fix US Budget Deficit and that by going through real democratic institutions US public finances will be balanced. Likewise, if public finances are not balanced yet, it is because voters are always ahead of politicians. In other words: the current budget deficit crisis is an issue of the Democracy in Americainstead of just financial adjustments. The first step Rasmussen takes to support his argument is to categorize American Budget Crisis as important as the Civil Right Movement, the US Independence or the Women’s right to vote. He feels US Budget Deficit represents one of the biggest challenges of American history. By placing Budget Deficit up to the top of the political priorities (and historical challenges), Scott Rasmussen’s thesis claims that the solution resides on the “People”, as other crisis did in previous challenges. For him, Budget deficit crisis should be addressed –and will be addressed-the way the Independence, the women’s and civil right were addressed. Now, if the “people” could make Budget decision directly, Rasmussen finds that the “people” would support eventually a series of Budget cuts. Broadly speaking, those cuts would be at the defense sector, social security, foreign aid, ground transportation so on and so forth. It is important to acknowledge that any voter would certainly be able to cut as much as he considers it is necessary. So would Rasmussen. Nonetheless, Budgetary Cuts are the direct outcome of budgetary increases which were made upon the time for some reasons that might still be part of the political agenda. A brief example is the defense proposal. Rasmussen finds that among the “people” “75% sees vital US Interest as only the reason for committing Military forces to overseas action”, or “just 11% say US should be world’s policeman” (Rasmussen, 2012. P 61). However Rasmussen forgets that US Military spending increased with its rise as a global powerful player, just to mention one example. There was a growing sense during the fifties and sixties that the world was an insecure neighborhood for the richest guys on earth. It would be feasible to fallow Rasmussen’s conclusion, if and only if, such condition is no longer in place: either US is not the richest guy on earth or the neighborhood is not dangerous. In the bottom, Rasmussen’s argument does not go further than what political scientists have come to call “Crisis of the Representative Democracy”. For the Author, the basic failure that has brought US to this point is that there exists a disconnection between Washington and what he calls “the People”. It is his understanding that politicians in Washington do not hear or do not want to hear the People’s willingness. Rasmussen bolsters his view by assuring that “American voters have, for the last four or five decades, consistently elected candidates who promised to reduce government taxes and spending” (Rasmussen. 2012 P. 259).Consequently, elected officials in Washington have only cheated on the political agenda. Now, the crisis of the representative democracy entails almost the same argument. In that framework there is not dialogue between leaders and voters and voters do not recognize elected officials as legitimize source of political solutions. In other words: no body speaks for anybody. Rasmussen’s argument supposes that current elected officials do not speak for the people they say they represent. Despite the fact that Rasmussen points toward a real problem in every democratic system, he also incurs in the same fallacy. The way Rasmussen explains his argument would make any voter think the following questions: who happens to be the “people”, who is Rasmussen speaking for? Why he thinks “the people” he sees has the “right” solution for the Budget Crisis? Those are the same questions that led the democracy to its current representative crisis. Obviously, Rasmussen protects himself by citing its multiples reports and statistically valid criteria. However, votes that elect politicians in a democracy are way more valid than just statistically. Finally, Rasmussen point out that going too much into details makes people lose the real perspective of the problem and confuses voters, especially, when it comes to the terminology. Going into Deficit details with sophisticated and intricate language is a powerful tool for discouraging voters away from the debate. For the author, it is important to keep the debate in simple terms so that everybody can see the forest instead of just some trees. It is certainly a good approach. However there is always the risk of too much simplification. Considering Rasmussen’s background makes his thesis hard to swallow. Polls and Pollsters lead officials to govern by the public opinion instead of by the law. It makes the democracy lose all its historical gains, and yes, including entitlements. Maybe in the future it will be possible to equalize polling with elections in order to see who holds the “right” solution, but in the meantime let elections and elected official make the decisions. That is the way the Rule of Law was meant to be. “Cutting edge” technology and its impact on democracy: the case of QUBE (1977) in Columbus Ohio.